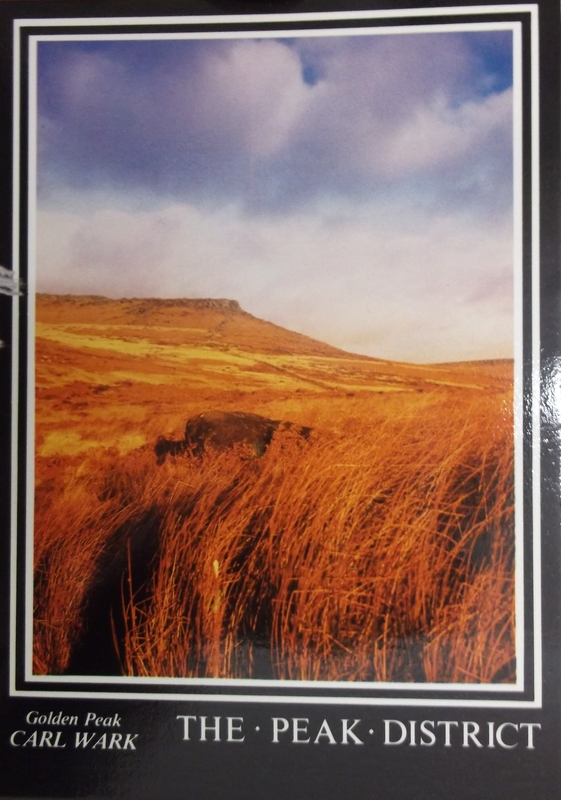 A recent addition to Picture the Past has been a collection of prints taken by Sheffield-based freelance press photographer Frank H Brindley, who photographed northern parts of the Peak District. Often Brindley’s pictorial submissions to local newspapers would be accompanied by a caption or even a short typed article. Some of these have survived and give a unique insight into both the man and life from the 1930s through to the 1950s. This has been a fascinating collection to work with and demonstrates how preserving this information enables a better understanding of the context in which such pictures came to be taken. A picture may well be worth a 1,000 words, but a 1,000 words, or even a few dozen, certainly adds something to an image! To see more of Brindley’s work, go to www.picturethepast.org.uk and click Advanced Search, then choose “Brindley F H” from the “Search by Photographer” menu. These photographs form part of the 50 Treasures exhibition currently in our vitrine wall. According to the Peak District Information website: “[Carl Walk] is very likely that the hill was fortified in the Iron Age (or earlier) at the same time as Mam Tor, which you can see from Higgar Tor, only a few hundred metres away, and a plaque alongside the hill records this. However, archaeologists now tend towards the view that the massive fortifications which can still be seen at the western entrance were probably constructed in the Romano-British period at the start of the Dark Ages, maybe about 500 AD, so the fort has a long and probably complex history of occupation. Along with nearby Higgar Tor, the hill is a fine viewpoint and makes a nice walk from the Fox House Inn on the Hathersage to Sheffield road”. There are thousands of photographs, postcards and other illustrations in the local studies collection – many of them are now available to search and view online via Picture the Past (if you’re stuck for something to do after a hefty Christmas dinner, why not indulge in some nostalgia looking through the images on here). I was delighted when staff at Chesterfield Library invited us to take part in their half-term reminiscence event, promoting the record office and our collections through craft activities with children and young people. So, last Tuesday I loaded up the car with a selection of craft materials, templates of trees, a large bundle of old and “less old” photographs of Chesterfield (courtesy of Picture the Past), as well as a small assortment of original archives to be displayed in the local studies section at the Library. As always our intergenerational ‘History of You‘ craft activity engaged children as young as two in the history of their family as they designed and made their own colourful, furry, feathery and leafy trees. Not unsurprisingly the parents and grandparents who came along too enjoyed the activity just as much (and sometimes even more) than their children, and they shared stories about why cousin Laura is called Laura, and how Uncle Mick met Aunt Sally. 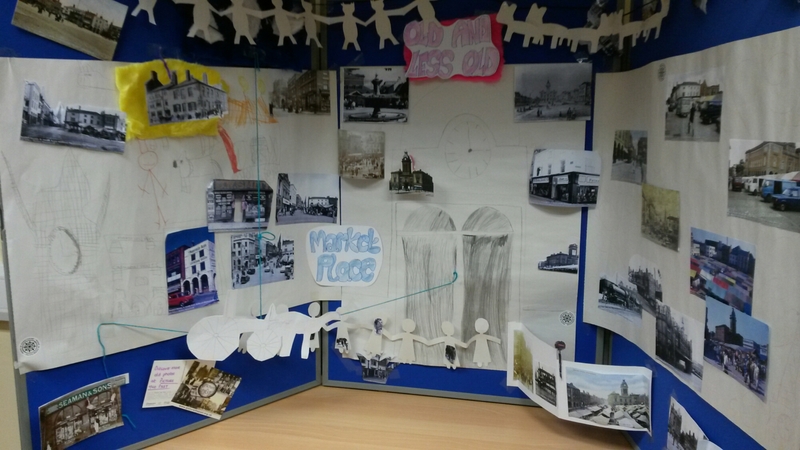 In the afternoon we tried something a bit different and, supported by third and fourth generation Cestrefeldians, a small group of 7-16 year olds prepared a display for the library revealing how Chesterfield Market Place has been used and has changed over the last 200 years. 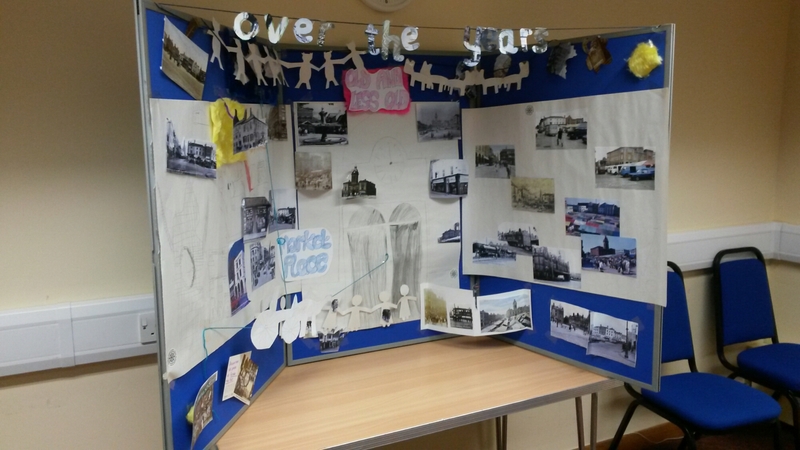 Inspired by the photographs from Picture the Past, the group re-created the clock tower of the Market Hall, created paper chains of people shopping and cows being sold, and arranged the old photographs to show a lively market town over the centuries and still going strong today. The whole day, which also included pumpkin badge making and owl crafting with Straight Curves, artefact handling with Chesterfield Museum and an exhibition on social housing from Homes For Good, was really fantastic and we were so pleased to be a part of it. The organisers have now started to think about the next event – and our table is already booked! Increased interest and media coverage in finding out about your past have encouraged people to think about what they do with their personal photographs. This has resulted in some wonderful collections being made available to ‘Picture the Past’. Some are loaned, some are donated but they are all the result of people wanting to share what they enjoy with others. This is great news for visitors to the website (www.picturethepast.org.uk) as it means getting to see, and enjoy, photos that previously might never have survived and probably would have ended up in the bin at some point. One of the collections recently donated includes photos by a prominent Matlock photographer by the name of Harry Gill. 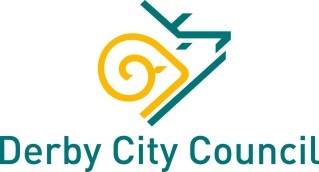 Harry was a freelance photographer whose work appeared regularly in the Matlock Mercury and Derbyshire Times newspapers. He developed (sorry for the pun!) an interest in cameras and photography at a young age, which was encouraged by his marriage to Clara Sheehan, of Bristol. She was herself a skilled photographer and his daughter Phyllis Higton, believes it was probably her influence which led him to take up photography as a career. Harry was a well known character in the local area and Phyllis remembers well her father’s studio in Matlock Bath, which was opposite to the Pavilion fishpond, particularly as she was often roped in to make the children smile when they had their portraits taken! He was obviously quite the entrepreneur, dashing across the road as soon as the charabancs arrived loaded with tourists, taking their photographs and having them developed and ready to take home at the end of the day. The collection includes images taken between the 1930’s and 1960’s, depicting life in and around Matlock and the Peak District. They include all manner of shots from carnival queens, royal visits and the Matlock Bath road widening. The collection has been very kindly deposited in the Local Studies Library, at the Derbyshire Record Office by Phyllis (pictured below). Digitised versions of the images will eventually appear on the ‘Picture the Past’ website which can be viewed by going to www.picturethepast.org.uk and we will share some with you over the coming months here. 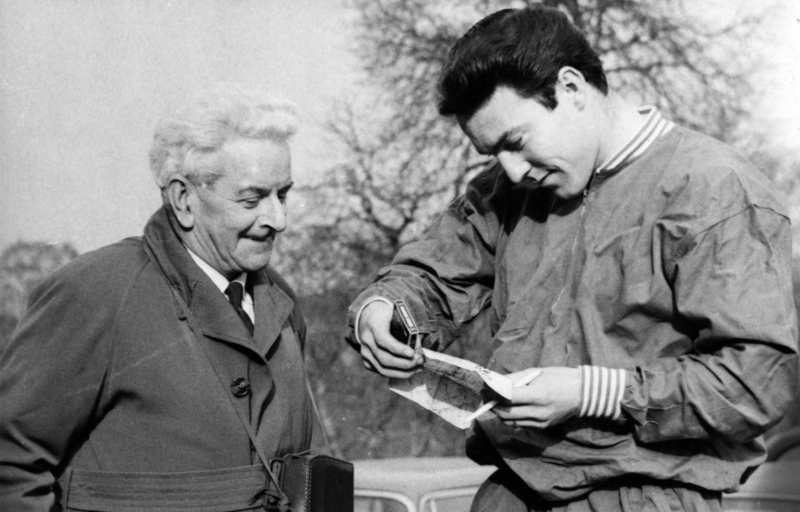 Harry Gill with footballer Jimmy Greaves, taken when the England team trained at Lea Green in 1964. 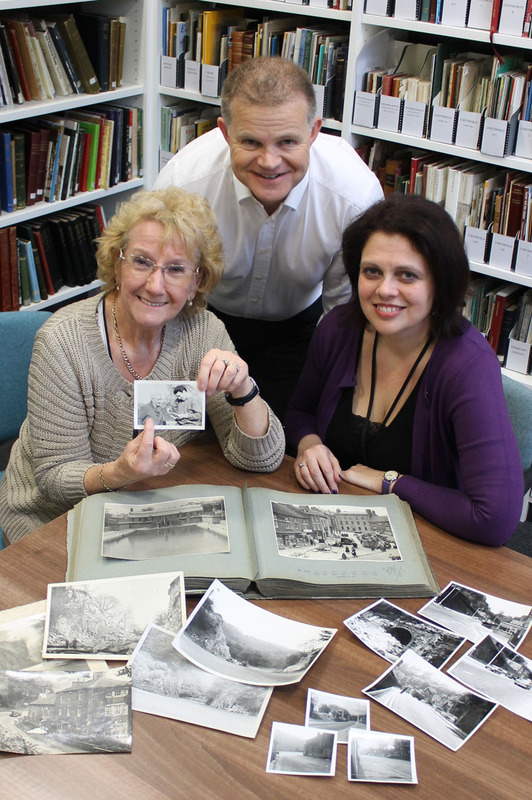 Phyllis Higton points to a photo of her late father, the photographer Harry Gill, before handing over his photographic collection to Lisa Langley-Fogg from the Local Studies Library and Nick Tomlinson from ‘Picture the Past’. This week I went to the record office for my year 10 work experience. I had an excellent time as it was extremely interesting and informative, and I learnt a lot. During my placement I took part in a range of activities such as , working in the search room , finding documents in the stores , using the microfilms , spending time in picture the past , cataloguing documents , working in the computer room and local studies library and my favourite activity of the week , working in conservation for a morning. Also I got to experience reception as well, although it wasn’t exactly planned…. Amongst all of these activities I also studied some maps of Matlock, some were recent and some were from over one hundred years ago. From these maps I wrote down about what things are still here now and what things have gone and changed and also what new things have been built and on a whole how Matlock has changed. I studied ordnance survey maps from 1880 , 1899 , 1922 , 1967 , 1981 , 1986 and 2006 and found that my house was built somewhere between 1880 and 1899 as it was not on the 1880 map but it was on the 1899 map so must have been built during those 19 years. I also found out that Matlock has changed a lot over the years and especially between the maps 1899 and 1922, although that is 21 years but in that time there was a lot of progress as a lido was built and there was a town hall and post office and more houses so we can see that after the first world war Matlock started to develop more and began to become more populated. One of the main things I noticed when I was looking at the maps was that although some of the buildings were there and they were used they had their name changed overtime for example, Castle view primary school was once known as Matlock County Junior mixed and infant school in in 1967 but of course now is now as Castle view primary. I really had a great time and feel as if I have gained some useful skills or enhanced the skills I already had. I also feel like I got a real insight into the type of work as I was dealing with real documents and was sorting them out, not only physically but also electronically on the computer. It was a fantastic week, I thoroughly enjoyed it!! !